Makawehi (“calm face”) is the name of the point in this area. 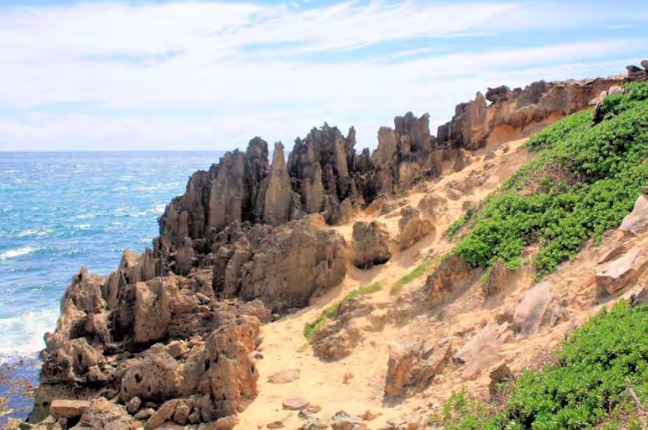 The unusual cliff formations were formed from sand dunes that have been weathered by wind and surf over the centuries. These ancient limestone sea cliffs have been virtually sandblasted by a combination of wind, salt and water. The lithified sand dunes that form Makawehi accumulated as sand dunes during the last “high stand” of the sea, about 125,000 years ago. As sea levels lowered at the peak of the Ice Age (about 18,000 years ago,) reaching its lowest point of around 360?400 feet below the present sea level, the dunes occupied a more inland position. From there, volcanic ash deposited onto the dunes and a coastal forest began to flourish. Rain percolated through the sand which partially dissolved some of the skeletal and coral grain sands. Lithified cliffs form as weathered fragments are removed by erosion and transported by gravity, running water, glaciers, waves and wind. These weathered rock fragments then eventually come to rest as layers of loose, unconsolidated material called sediment. This material may subsequently be subjected to compaction and cementation, causing it to be lithified into solid rock. The area along the shoreline is accessible at its south end via a footpath leading from Keoneloa Bay and the Hyatt hotel along the Makawehi/Pā‘ā dunes. Businesses and community groups jointly prepared an interpretive guide for this trail and sponsor occasional guided walks from the hotel to Punahoa Point. Today Makawehi point is being undercut by continual wave erosion. The huge blocks of limestone that lie at the base of these cliffs are examples of that erosion. Caution: Stay well back from the edge. Jumping (or falling) into the water has caused serious injury and loss of life.